Sold by ecowitt au and Fulfilled by Amazon. Gift-wrap available. 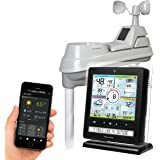 Ecowitt Professional Wi-Fi Weather Station provides accurate, reliable weather monitoring and supports uploads to Wunderground/ WeatherCloud/WOW via Wifi connection. 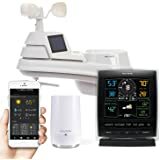 Designed to provide the weather data you need for home use, gardening, educational purposes, boating and more. 3. 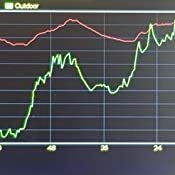 Measures wind speed, wind direction, rainfall, outdoor temperature and humidity, solar radiation and UV. With a temperature, humidity and barometric pressure sensor inside the console. Note:This weather station doesn't have PC Software function. 4.0 out of 5 starsTFT already kaputt! I choose the TFT version of this station over the LCD panel one. Looked great for the first week but then the trouble began. The screen degraded into a mess of flickering lines horizontally and vertically. Sometimes I can gauge what the display is trying to show, but it's mostly unreadable. The sensor array is working as expected and the data transfer to WU is still happening. I can use my other devices to look at the data there. I am no longer able to change any settings of the station because I cannot see what I am doing. I'll try to get the display replaced. Upgraded the rating to 4. Why? Received the replacement display yesterday and it was relatively easy to swap it with the faulty one. Only needs a bit of planning to have all the required data at hand, like WU ID and password, as well as any calibration values you applied to the previous display. In my case it was a 180deg adjustment to the wind direction (Southern Hemisphere) and the offset value for the relative barometric pressure (85m above MSL) for my location. Oh, also had to adjust accumulated rainfall data for year, month, week and day. The new display connected out of the box with the existing sensor array. Firmware (1.3.9) adds a handy graph display for most recorded data (up to 72 hrs history) - very useful for users who did not connect to any web service. Very happy so far - hope it lasts longer than the previous one. Still think that the TFT is far superior to the standard LCD display. Full pixel control vs. given shapes. 5.0 out of 5 starsGreat Value, Works Well. I am very happy with my new Ecowitt HP2551 and can thoroughly recommend this Weather Station. The delivery and purchase process through amazon was prompt and efficient. Once I received it, it was easy to get up and running. The TFT display looks great has wide viewing angles and I feel it is worth the extra cost, when compared to the older LCD models The display has the ability to toggle between paperwhite and black backgrounds depending on your preference. The higher resolution of the TFT means is can display many more elements on the home page screen. No need to press a button to see the yearly rainfall. It is there to see all the time. No problems with the base unit getting a signal through the iron roof of my house to the sensor on the roof. My HP2551 is concurrently sending observations to Weather Underground, Weather Cloud and UK Met office without fuss for the past 6 weeks. This Weather station records an onboard archive of observations, configurable down to 1 minute intervals. This can be reviewed at the press of a button. The ability to subsequently export this entire archive of weather records from the HP2551 to a micro SD card is quick and simple. Handy for the geeks amongst us and anyone you want to keep a separate archive, or to use the CSV file elsewhere. As can be seen in the pictures, the HP2551 has the sensor setup in a “I” configuration rather than the three arm “Y” seen on the HP2550 and other similar variants. The rain collector on my unit is fractionally larger in diameter, at 11.28cm instead of the 11cm that was seen on some older models. This means it has a collection area of precisely 100cm2. 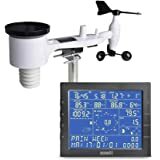 This is good for the geeks who may whish to calibrated and tweak the rain gauge gain. Ecowiit customer support have been excellent and have offered prompt customer support when required. They provided me a new firmware within hours of reporting an issue with the rain gauge. Updating the firmware is as simple as placing the file on a SD card and plugging it in! 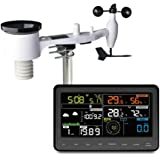 Definitely consider this model if you want a simple to use, inexpensive weather station with a nice clear display panel. You can be assured in the knowledge that you will get good support from Ecowitt. 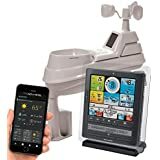 I was pleasantly surprised with the Ecowitt HP2551 weather station. It was relatively inexpensive, well constructed and easy to set up. The display and menu have been intelligently designed and are easy to use and all sensors including rainfall are able to be calibrated. I emailed support with a query about a firmware update and received an immediate response with the updated firmware. The new firmware adds an additional graphical display. They have now improved their web site to allow direct download of the firmware. 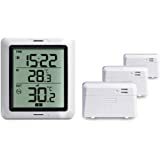 I have ordered direct from Ecowitt two additional WH31 temperature sensors and the required GW1000 gateway (neither are currently available on Amazon .com.au). If you report to Weather Cloud (in addition to Weather Underground) you can view your internal temperature along with all the other data direct on their website. So far so good. The weather station has done everything it is meant to. I did a lot of searching however evenetually it comes down to one made by "fine offset" or a unit like a davis at 3-4 times the price if you live in Australia. Fantastic item with fast delivery. 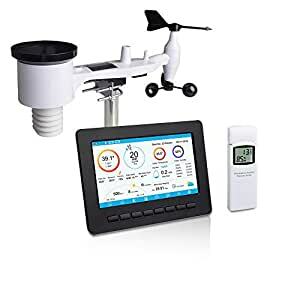 I bought this to replace a different brand weather station which failed every time it rained (making it pretty useless). Not only is this one 100% reliable, but it looks better AND the colour console is much easier to read. highly recommended. Weather station arrived with clear instructions, was easy to set up and install and started working straight away. Great set of functions and the screen displaying it all is really easy to follow. 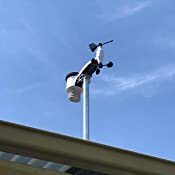 Station is easy to set up, join to wi-fi & put on underground weather. The display looks great.